Could you host FOCSLE Music at home? Not regularly, I mean! We have occasional need for an alternative, non-cost venue, for low-profile events when The Guide Dog is unavailable. and, ideally: on a ground floor; with nearby parking; with a reasonable acoustic. (Public Liability) Insurance is covered by our membership of SCoFF/EFDSS. We ask visitors to bring their own drinks and vessels, so there’s no need for you to provide catering (unless you like to). Larger spaces are of equal interest. Jon and Paul will occasionally write some notes here, such as Jon's "e-Postcard from Kolkata" [= Calcutta], where he sojourns for five months of the year. (Following a change of platform by Focsle.org's ISP, Jon's e-mail is not working currently, until Paul has time to sort it out). This links to a newsletter Jon has written about his time over there, and reports on his campaign to oust the use of child labour in India’s brick production. Interesting and trenchant views on the situation over there, well under-reported in the UK. Read this map in conjunction with notes below it. Note that it doesn’t zoom (sorry). Unless travelling a distance, cycle is the best way to get to The Guide Dog. Several bus routes serve Bevois Valley Rd [= BVR] or Lodge Rd (or, more distantly, The Avenue: the Middle St / Southcliff Rd stop is nearer than Stag Gates / Lodge Rd). Walking or cycling is the only practical way to get from St Denys Station. Look for spaces on Earls Rd, or Spear / Clausentum Rds (or its offshoots), including a short cul-de-sac at the T-jn with Ancasta Rd. If none, turn right (from Clausentum Rd) towards pub. 1a & 1b merge there. (Bevois Mews, making a mini-crossroads here, is private). Into one-way section of Earls Rd (2), with more spaces both sides. Pause at T-jn, to check for spaces across BVR, directly opposite (3). Before pulling out, ensure it’s sufficiently traffic-free for skewing across both road lanes and stopping in the road. If parking there, walk back via Earls Rd. If 3 is full, [turn left and turn into next left, a cul-de-sac (4). Availability unlikely (only 7 spaces), but it’s in sight of the pub.] Currently (= early 2019) cul-de-sac 4 is blocked by temporary construction access and containers for the plot south of Ancasta Rd. No idea how long this will obtain, but will report back when/if it’s cleared. [If 4 is full,] turn left and, hard after the pelican beside the next block, turn left into Bevois Valley Car Park (5), with 14 spaces. (It is signposted, but only at the entrance, and easy to miss in the tangle of supporting-poles for the lights). Should THAT be full, emerge at far end (car park is one-way) and turn right, back on your route. Before Aldi’s access-road, there’s another long streetside layby (precisely where the digit 5 is on the map). Don’t be tempted into Aldi’s car park (marked, on Net maps, as if public). Google Maps shows the access as a one-way street. For non-shoppers, it’s private, and may well be locked before FOCSLE Music finishes. Before pelican, scan ahead for spaces at 3; if none, turn left into Kingsbury Rd (6), with single yellows both sides. Walk back, using pelican, and up Ancasta Rd, where you can see the pub sign on its gable. FROM SOUTH (City Centre / Onslow Rd), start this sequence at point 3. 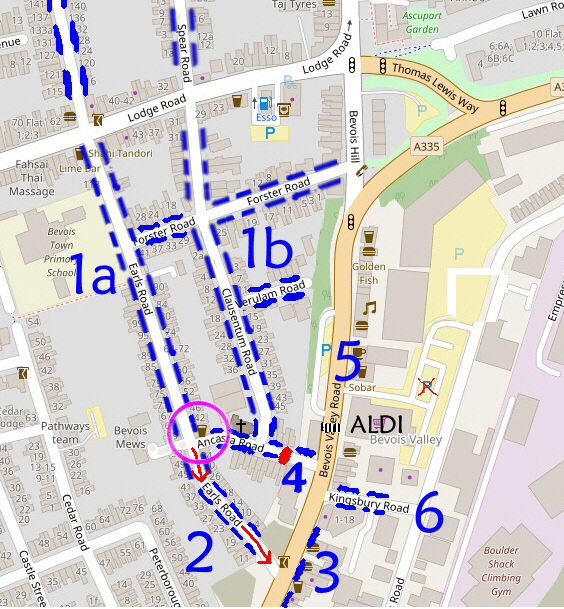 After BV Car Park, you may prefer to go up the hill and turn left (before the lights) into Forster Rd (more potential spaces), and turn left into Clausentum Rd, following directions from top of this section. While availability will vary, week to week, once you’ve found a zone that has spaces, you could ignore this circling round on subsequent visits, and head straight for it. If you ask, we’ll fix for a marshall to meet those who park in BV Car Park and / or Kingsbury Rd. At closedown, it takes very little time to reset the room, so the night’s Organizer can also ensure (personally, or by engaging someone else present) that no-one has to return to their car alone after dark. Feel free to ask, if that’s an issue for you.